Digital Retinal Imaging allows your Allen eye doctor to evaluate the health of the back of your eye, the retina. It is used to detect diseases, such as Diabetes and Macular Degeneration. It is critical to confirm the health of the retina, optic nerve, and other retinal structures. Many eye diseases, if detected at an early stage, can be treated successfully without total loss of vision. Your Retinal Images will be stored electronically. 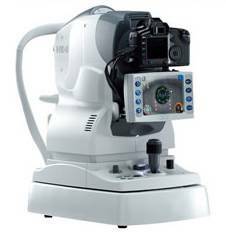 This gives the Allen Eye Doctor a permanent record of the condition and state of your retina. This is very important in assisting the Eye Doctor to detect and measure any changes to your retina each time you get your eyes examined, as many eye conditions, such as Glaucoma are diagnosed by detecting changes over time.